IF SHE’S GIVEN , IT’S LIKE I HAVE ALSO RECEIVED. It was a Friday 26/11/2015 at 8:00am, I saw this child with her mother and sister at Meeting Point International head office together with gifts that she had received. A child was dressed in white, with a smile. In her smile rose in me a desire to get to know her and to understand what puts that smile on her face. It’s something unexpected yet, so much desired, so I decided to put a question to this family in order to learn more from them. Bright: Tell me more about yourself? One day I found a baby who was delivered and dumped. I asked myself if Aunt Rose embraced me with all my nothingness, why not me? Suddenly I picked the child, she is now 6 years old, and I named her Gift Lamaro because to me she is a Gift, she studies from Luigi Giussani Pre- Primary and Primary School and this made me to learn more the meaning of my life. Bright: How many children do you have? Mother: With Lamara Gift, there are 11 children and we are very happy because one of them finished a course at the university and she was supported since primary, I am filled with gratitude towards Meeting Point International because all my children are supported. Bright: How long have you been in Meeting Point International? Mother: It’s now 13 years. Bright: What would you say to the sponsor of Kitui Lydia? Mother: I cannot find appropriate words to express myself to her but the only thing I can say to her is that, I am very thankful for the support given to Kitui Lydia and my family. All the children are happy because of the support. We received mattresses not only for Kitui but also for the others, I pray that God protects her and makes her happy. Bright: What do you do? Mother: I sell paper beads and sometimes I go to the stone Quarry in order to support my family. I am also in the village saving groups with the other women of meeting Point International, this saving has also helped me to support my family. Bright: What did Kitui receive? 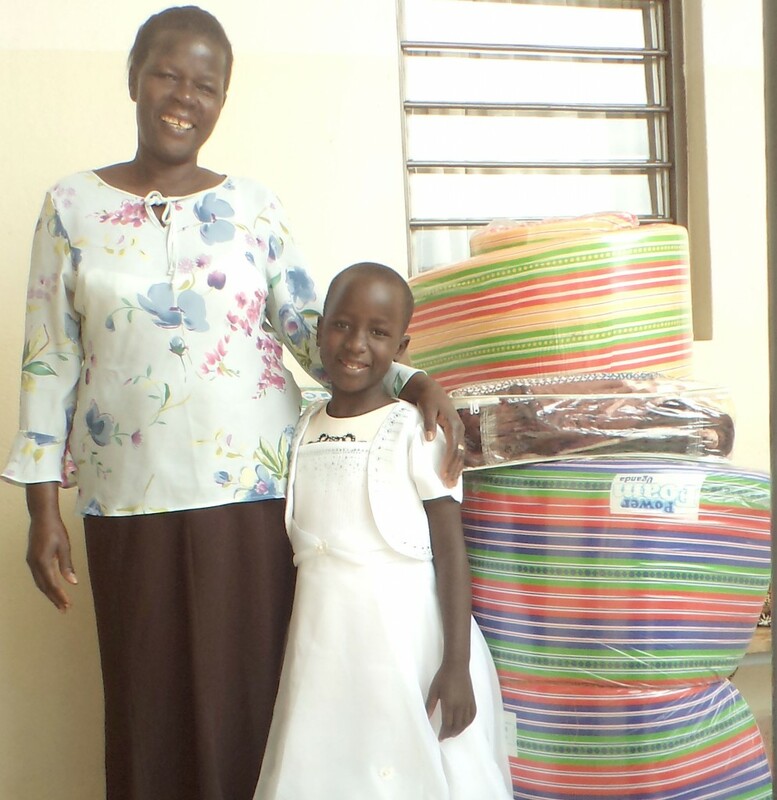 Mother: I am very, very happy because it is a very good thing to me; she received 3 mattresses, a triple decker, 2 pairs of bed sheets and a dress. Bright: I also asked her sister Irene who was present at that moment how she felt when her sister receives a gift!!! Namasaba Irene (Sister): I feel great because the sponsor is showing a lot of love towards my sister, so I feel happy for her because my sister is like myself , if she’s given , it’s like I have also received. Bright: Lydia was more excited and she responded before I could ask her any question. Kitui Lidia: I am 6 years old and what I can say to my sponsor is that I am very happy. I am in primary one; I am studying from Luigi Giussani Pre-Primary and Primary school and I also love the school, I love the new dress. After talking to Lydia and her family, I want to constantly remember that family, every day. WHO LOVES LIFE, GIVES IT AS A GIFT. Rose Busingye has been interviewed by an Italian journalist about the visit of the Holy Father in Uganda; listening to her has been a great occasion for having an overview about how the presence of the pope in Africa is relevant for the circumstances that the “first and the second world” are living now. The real challenge to face is linking the interest of the pope for every person in the world to the challenges that everyone faces in daily life. Rose Busingye has focused on this point clarifying that what really matters is the meaning that every human is looking for in his/her life. The first question of the journalist was about the meaning of pope visit. What does the presence of the pope in Uganda mean for her and for her People. Rose said «the thing that I really realized is that Christianity is done for the every human being. Christ comes in man’s life because it is what every human being is done for and looks for». This was not the first time Rose met the pope, but is the very first time that it happens among her people. In front of Francesco there were people of different confessions and religions, all in front of him. What allows us to stay in front of a meaningful presence beyond all the differences? It is that we are all done for the same purpose: recognize the One who can give meaning to every aspect of life. Rose was asked about the perception that African people have about the pope. Sometimes in Europe, public opinion try to reduce the Holy Father and what he does to political leanings, but Rose simply affirm that for an African things are simpler. He is the responsible of the Church: from Peter to Francesco he is the one God has chosen. The journalist asks Rose’s opinion about the “interest” that the pope is focusing on Africa. Rose underlines that every person here is looking for God. There is no atheism in Uganda because the fact of living, here, corresponds to the awareness that our life is linked to someone who can make it meaningful. Everyone in Uganda knows that is made for something greater that what himself or “the world” can provide. The next question focuses on the theme of the third world: the journalist underlines that the presence of the pope can be link to the needs of this continent, but Rose explains what poverty is underlining the real nature of it. There is a difference between poverty and misery. A person can be poor even if is covered of money. Being poor means that not to be aware of what really give a meaning to life. If someone takes care of the poor, he does because has been educated to recognize that the value of that person is greater that the material condition and the challenges his/her has to face. SOCIAL WORKER ANNUAL REPORT, AN OVERVIEW ON OUR WORK. Working to collect the documents for the Distant Support Program of AVSI, MPI’s (Meeting Point International’s) social workers have the occasion to look at the impact that our work have on vulnerable children supported. Two times a year the donor has to be updated with information about the child supported and the Social Worker plays a key role in this communication: he or she is the one in charge of building the bridge between two different cultures in order to show how the money provided has been invested in the path of growth of the child. This work takes a long time, and is a great occasion for a critical review on the work done during the year. Reading through the personal communication of the child and the communication written by the Social Worker, I was surprised in front of the great things that can happen when a person is accompanied in the challenges and the efforts of everyday life. The first thing that got my attention was the fact that there are very young people, thanks to the social workers and the carefulness of the teachers, who have a great awareness of themselves and of what really matters in life. In particular there are two twins who attends the “Luigi Giussani High School” who underlines the teaching method of the school they are attending. These girls explain that the aim of the teachers is not only to make them learn information and skills, but they want that the children can discover themselves, their qualities and their potentialities. The method is to introduce them activities that reawaken all the desires they have: art to reawaken the desires of beauty, dance and sports for discover all the potentialities of the body, Theater and Drama of African tradition to develop the awareness of their history. «The best day of the year has been the one of Music Dance and Drama: all the students participated. Different events took place like folk songs, traditional dances and poetry were performed. Everyone was completely astonished and excited. What a day it was», wrote a girl. The beauty of this experience is possible, thanks to what is happening here, the carefulness of the teachers and thanks to the fact that someone in another continent decides to invest on the current situation of a vulnerable child. It generates a gratefulness in the child that gets aware about the fact that they are not alone in front of their challenges and it reawakens the affection for who is making it possible. The twin of the girl mentioned above writes to her donor «I have always wondered who you are to me. Sometimes I can think that you are just a sponsor to me, but I found out that you are a family and every time I wake up, I pray to God to keep us close. No matter how the distance is. I still know that you really care about me». These witnesses are just the aim of the iceberg of more than one thousand children that are supported and accompanied in their life. The most clear perception I had meeting these young people is that they know that they are not alone and the fact that someone is interested in their situation and wants to be their friend and walk with them. People don’t need their problem to be solved, because behind the solution there are other problems that arise, people need to discover that they are not alone and that happiness is something that can really happen. In the SWAR of a Social Worker, it is very well explained «We do not only want to take the children to school, but we want them to experience care and love; that in front of their suffering, there is someone thinking about them and always there with them in each challenge they meet».